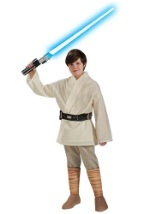 Help protect the galaxy far, far away in this kids deluxe Chewbacca costume. This costume comes complete with a dark and light brown fur jumpsuit. It buttons in the back for closure and has long sleeves and pant legs. A latex bandolier with a pouch sits on one shoulder and hangs at the opposite side. Latex gloves are black on one side with brown grooves on the other. Those same grooves cover the latex mask which slips on over your head. The mask has slits for your nostrils, eyes and mouth. 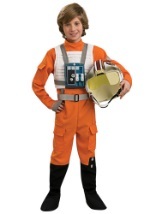 You'll become Han Solo first mate in this licensed Chewbacca costume!